A panic attack is a sudden, extreme fear that seems to come from nowhere and with little or no warning. Fear is the body's alarm signal, alerting us to a potential threat. When we have a panic attack we feel the fear but there's no real threat - a panic attack is a kind of 'false alarm'. This information sheet can help you recognise panic attacks, understand them, and learn some ways of reducing them. Everyone's familiar with brief periods of panic; maybe when we think we've lost our child in the supermarket, narrowly avoided a traffic accident or crossed a road without looking. These brief 'heart-in-the-mouth' moments come quickly and they pass quickly. Panic attacks are different. They tend to last a bit longer and seem to start with little or no warning. The fear is more intense and they're not related to any of 'near misses' such as those above. Panic attacks usually last for less than 10 minutes. It's common for people who have panic attacks to stay at home and avoid the situations and places where they might panic - agoraphobia and panic often go hand in hand. They may also have (or develop) social anxiety and depression. Panic attacks are very common; most people will understand what it means to have a panic attack from personal experience. Some people will only ever have one panic attack; some may have more than one a day. Some people might have several, then no more for years. Panic attacks are hard to predict, but seem to be linked to the level of stress we're under. Panic attacks are so upsetting that many sufferers think they're dying or going mad. In reality, panic attacks aren't that serious - though they certainly feel as though they are. The physical symptoms are dreadful; the chest pain and shortness of breath can make people think they're having a heart attack. However panic attacks are not, as some people may fear, signs of serious mental or physical illness. When we panic, the fear and desire to escape can make us feel ashamed. In the midst of a panic attack we might leave our shopping behind and bolt out of the supermarket. At work we may feel we have to run out of a meeting. The shaking and sweating makes it seem as though everyone will notice, making us feel ashamed and want to escape even more. We can think about the symptoms of panic in four groups - physical sensations, emotions, thoughts and behaviour. Do you have any other physical symptoms not listed above? Make a note of them. Do you have any other emotional symptoms not listed above? Make a note of them. Do you have any other 'thought' symptoms not listed above? Make a note of them. Do you have any other 'behaviour' symptoms not listed above? Make a note of them. Everyone who has panic disorder will have panic attacks. However, if you've had a panic attack it doesn't necessarily mean you have panic disorder. Panic disorder can only be diagnosed after repeated, unexpected panic attacks that are followed by at least one month of worry or altered behaviour (usually avoiding people, situations or places). Some medical conditions can produce similar symptoms to panic disorder. Before a diagnosis can be made, any underlying medical causes will need to be eliminated. A panic attack is a sudden rush of fear or discomfort accompanied by at least four of the symptoms listed below (table 1). A 'sudden rush' means the symptoms peak within 10 minutes. Episodes like panic attacks, but with fewer than four of the symptoms below, are called 'limited symptom attacks'. We don't know precisely, it's most likely to be a combination of things. Our genes, our experiences and our outlook on life all play a part. Sometimes panic is triggered by things that happen to us, often a sudden extreme stress of some kind, or continued stress over a longer period. Some people seem to be more prone to panic than others. More women than men seek help for panic disorder. We know that the part of the brain called the amygdala is involved in panic attacks, and that willpower alone isn't enough to stop them. Panic attacks may happen for the first time when we're ill or under a great deal of stress. Low blood sugar can cause the symptoms of panic, as can drinking too much caffeine (caffeine is found in chocolate, tea, coffee, cola and energy drinks). Many women have their first panic attack when they're pregnant, possibly linked to hormonal changes. Thyroid problems can produce similar symptoms, as can certain heart problems. If you think your symptoms might have a physical cause, you may want to make an appointment with your GP to eliminate any possible physical causes. 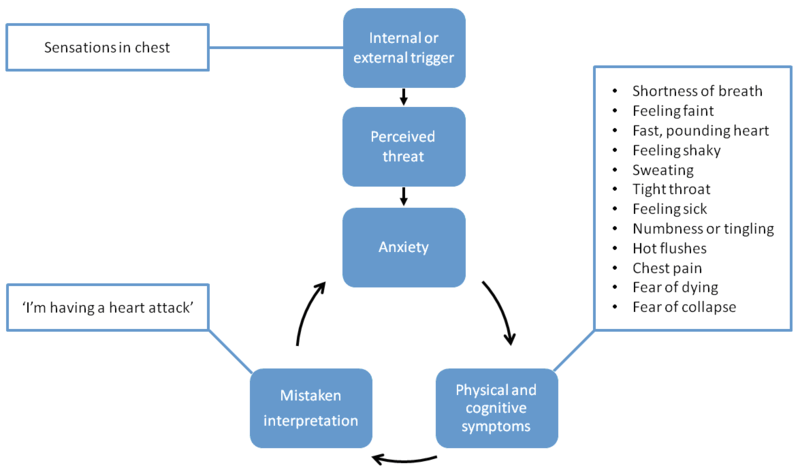 The diagram below shows Clark's panic model (figure 1). Some sort of trigger occurs - it might be something that happens to you, a situation or perhaps a thought, emotion or sensation. Our 'threat assessment' system kicks in and we think it might be a threat of some sort (maybe to our health, or perhaps to our pride or social standing). We begin to feel anxious. We have a range of anxiety symptoms, which we then focus on and begin to worry about. We misinterpret these symptoms as signs of something serious, which increases our anxiety in a 'vicious circle'. 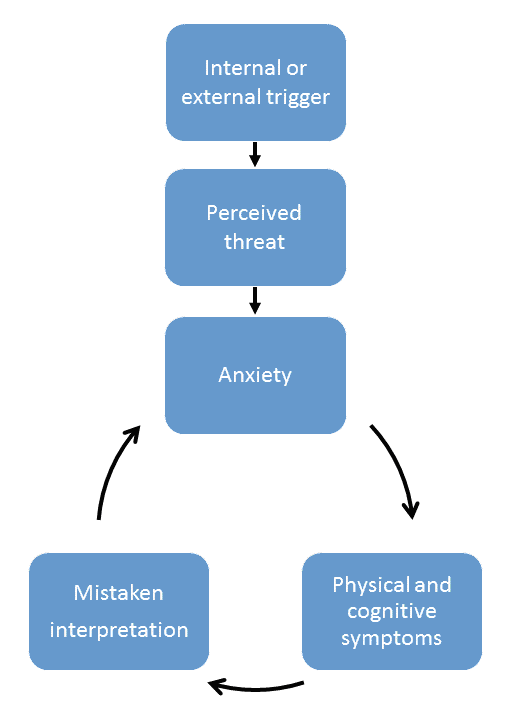 In the following example, a sensation in the chest begins a cycle of anxiety, which increases until a panic attack results (figure 2). Try this for yourself. 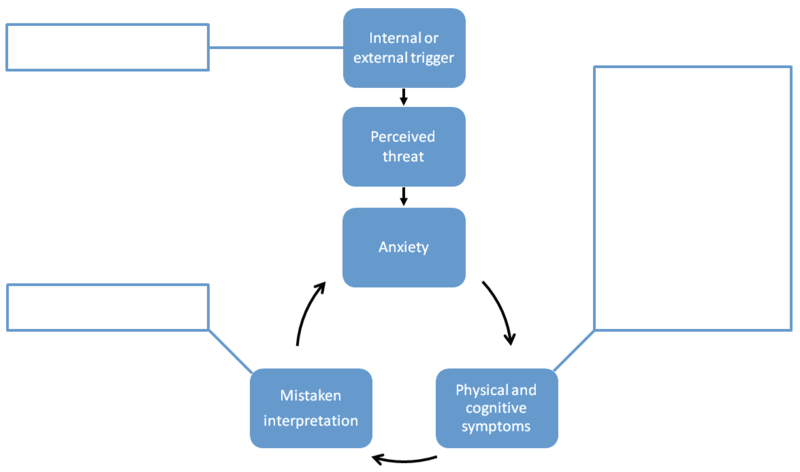 Think about a recent panic attack ... fill in the missing details in figure 3, showing what might have been the initial trigger, the physical and cognitive (thinking) symptoms you experienced and how you could possibly misinterpret those symptom, leading to further anxiety.